We're branching out and offering something that's not quite a cookie, not quite candy. 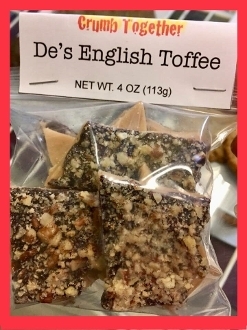 This is proper English Toffee - rich, buttery toffee coated with a thin layer of dark chocolate and topped with chopped hazelnuts. Uncle Tony has a British Grandma that would be proud of it.